We are a leading Manufacturer of hollow rubber roller, industrial silicone rubber roller, printing rubber roller, rotogravure printing rubber rollers, vmch coating rubber roller and rubber rollers from Ahmedabad, India. We offer Hollow Rubber Roller to our clients.These rollers are made by quality raw materials with then help of our latest machinery,which are at very affordable price. Color available Orange, Red, Yellow, Blue, etc. We are offering Industrial Silicone Rubber rollers in different colour & sizes that can available in customers required hardness along with surface grinding and suitable Bearing size. We have used an ultimate quality silicon raw material that is having extremely high temperature range furthermore it is best electrical insulator too. Additionally we have provided silicon heating Base in it. Our products are well-checked by our experienced professionals on various parameters that ensure our clients for trouble less & efficient working process. 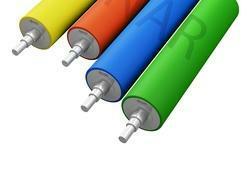 The latest technology is used for polyurethane covering of various Printing Rubber Roller. This method is called rotational casting or ribbon flow molding. Production of covered rollers at the minimum time with best surface quality is possible. Any size rollers or rolls with metalcore or only lining can be manufactured as per customers requirements. Color available Orange, Black, Red, Green, etc. We offer Rotogravure Printing Rubber Rollers to our clients. 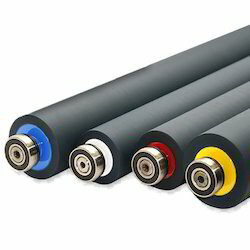 Our rotogravure rubber & lamination rubber rollers in indian & international printing industries. our rollers are made by using the ultimate quality raw material and world-class technology for most excellent printing results. These rollers are available in EPDM, neoprene & nitrile rubber with ifferent bearing sizes as per client’s necessity. There is a provision of customized products as per client requirement. We offer VMCH Coating Rubber Roller to our clients. The art of compounding and high quality raw materials by Anar Rollers, guarantees excellent mechanical properties with lowest abrasion and high resistivity, equivalent to Industrial standards. It helps the customers improve their efficiency in the operations. Size Length Upto 8 Mtr. 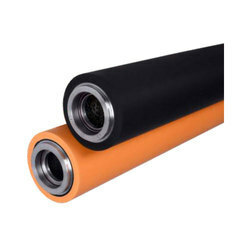 Rollers are the basic and primary accessory for web process control. Even surface, the appropriate material of coating according to the application, uniform hardness over the surface, along with the precision workmanship play vital role in the performance of the roller. Selection of roller type and coating material depend upon the application and the web material. 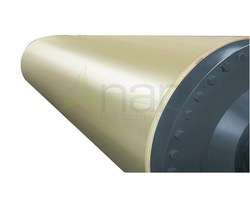 ‘ANAR RUB TECH’ manufactures a wide range of rollers for varied applications. Uniform hardness all over the surface within +/- 1 shore “A” variation. A wide range of coating to counter chemical/solvent effect. Outstanding rubber surface finishes without porosity. 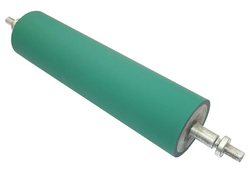 We are manufacturers of Silicone Roller for various applications in different industries. Specially built for the Lamination industry, Plastic / flexible industries and much more. 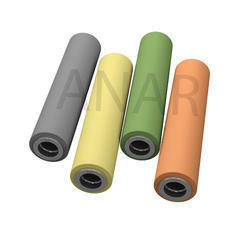 Available Silicone Roller with various colors and sizes with premium quality. We have been manufacturing Silicone Rubber Roller with the effectiveness of low compression set with good rebound and ozone resistance. Featured with different hardness, various size, shapes, non-stick surface, non-porous surface and temperature resistivity. Color available Blue, Silver, Red, Yellow, Black, Yellow, etc. Our industry is involved in manufacturing and exporting a quality range of Printing Rollers all over the world to our clients. These are strong and sturdy in nature with high level of performance. The rollers are highly durable and are designed by expert team and skilled labours. These are widely used in various printing industries. We are offering our products at customized standard as per our client’s need. Application Paper & Packaging,Printing,Textile Industries etc. Max Dia Upto 6 Mtr. Usage/Application Paper & Packaging,Printing,Textile Industries etc. 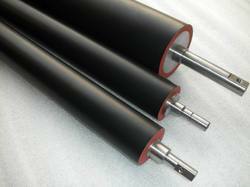 We are one of the eminent manufacture and exporter of Rubber Rolls in the world. These are fabricated with new technologies and innovative ideas as well. We are successfully catering to the needs of expanding multiple markets in India as well as aboard. Capacity Length Upto 6 Mtr. Offering quality assured gamut of Film Plant Rubber Roller which are assistance of quality assured raw materials and modern techniques. Additionally, the proffered assortments are loved by patrons for many grounds like cost effective rates, durable, designs and smooth finish. Offering our solvent Based Lamination Rubber Rollers to our esteemed customers at most competitive prices in different diameters & bearing sizes. the material used to make these rollers is specially researched by our ANAR team on client demand, these rollers are generally available in shore hardness 80-85. the outstanding performance of these rollers can be glimpsed in all solventless based machines. Anar Rub Tech manufacturer & exporter excellent quality of Jockey Roller and our product is used in textile industry. We are leading manufacturer of Ebonite Rubber Roller and all type of Rubber Roller . It is featuring with different dimensions, thicknesses, quality, and finishes as per the client’s requirement and industry specific. Also, our Ebonite Rubber Roller is featuring as anti-static, light weight, low noise, and friction, smooth surface finish, easy installation, dimensionally accurate, resistance from oil, abrasion, and rust. Our engineers had built Ebonite Rubber Roller which is applicable in all kinds of Industry like paper, textile, plastic, steel. Excellent capability with premium quality to withstand high temperatures of water and steam. We are actively engaged in offering quality assured gamut of Film Plant Roller. Provided gamut is manufactured by engineers with the assistance of quality assured raw materials and modern techniques. Additionally, the proffered assortments are loved by patrons for many grounds like cost effective rates, durable, designs and smooth finish. Color available Grey, Green, Red, Blue, etc. 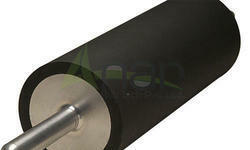 We offer Solventless Lamination Rubber Roller to our clients. Our Solventless Lamination Rubber Rollers for plastic and flexible packaging industry. They are made of finest quality polymers that possess excellent chemical resistance & durability, retaining their shape for a long period of time. 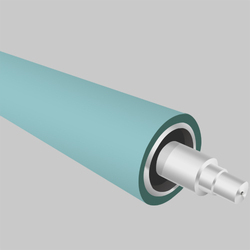 Our Solventless LaminationRubber Rollers / Sleeves have extraordinary performance and are highly solvent resistant against various adverse effects. Anar Rub Tech Pvt Ltd is the foremost manufacturer and supplier of Spreader Roll in India. Our product is used in Flexible Packaging/Textile/ Paper Industry at reasonable price in India. Color available Orange, Red, Black, etc. 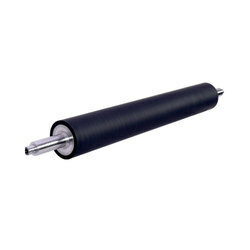 Offering our best quality Flexographic Rubber Rollers to our esteemed customers at very affordable price. It encompasses pure EPDM rubber coating that is excellent resistive to various chemicals also having 60-65 shore hardness with surface grinding. These rollers are available in different diameters & Length as per suitability of client’s requirement for various applications along with the necessary bearing size. We always inspect & apply various tests on our product for assurance of its strength and functionality to buyer. 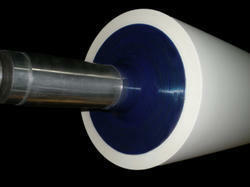 Our rollers are well accepted by our customers for its high speed printing & smooth finishing. Color available Black, Maroon, Red, Blue, etc. We are the leading manufacturer of Raffia Machine Rubber Rollers,With the new metal cores in hand, the rollers are cleaned and coated with a bonding agent and are manufactured by molding, wrapping or extruding rubber onto the metal. Using heat and pressure vulcanization cures the rubber, and bonds the rubber to the core. 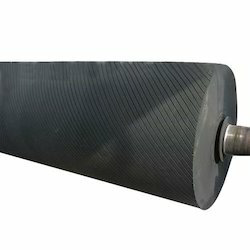 In the case of conveyor rollers many times a permanent bond is not desired so a rubber sleeve is made slightly undersized from the core diameter so the sleeve can be pneumatically slid over the core for a tight, non-slip fit. Cynoacrylate bonding of rubber and metal after curing is also available and particularly useful for segmented rollers, this includes secondary operations to assemble. For plastic cores, rubber sleeves are made and either blown onto the core or glued. 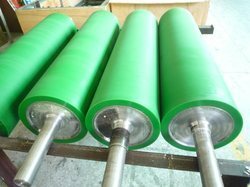 We are offering our best quality Chemical Resistance Rubber Roller at very affordable price which are produces by best quality raw material by our latest technologies machinery . Our adhesives and coatings can be applied to flat rolled goods such as plastic packaging, paper and laminated foils in any number of ways. Nearly all techniques use hot adhesive, and the product is dipped or the adhesive is sprayed on. Some processes use a “pickup roller” that is half-bathed in adhesive and transfers glue to the stock as it runs over the top. After application, drying and curing ovens are often used. In some situations, however, the adhesive is applied cold, and a special heat transfer roller heats the coated stock. This is prominent in the textile and nonwovens sectors, especially with waterproofing coatings that must be heated to leech into porous fabrics. Heat transfer rolls are fairly complex products. Higher performing designs are double-shelled, with pre-heated (or pre-cooled) thermal transfer fluids flowing between the two shells (see Figure 1). Heat transfer fluid chemistries vary widely, although most hot versions use oil-based fluids, while cold rolls tend to use glycol or water. 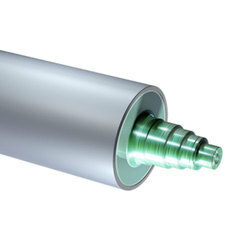 The roller’s shafts are bored to accommodate fluid entrance and exit, and the inner shell features a raised, spiral-wound wrap to facilitate even fluid distribution. After long experience of continuous innovation and development in Tap Line Rubber Rollers and working closely with our valuable customers. Our expert staff of R&D laboratory has put into practice the Quality Control department; we design and manufacture wide range of Tap Line Rubber Rollers according to the needs and demand of the customers. Our customized excellent quality tested series of compounds which are skillfully and efficiently used in Holography, Corona Treatment, Tape Plant, Poly coating, Garmex, M.D.O NIP roller for Film Plant, Epoxy Coating etc. with hardness between 15° to 98° shore A. Further to easily carry temperature up to 350°& ability of absorbing good energy, series of compound produces superior mechanical properties for long endurance even in extreme conditions. 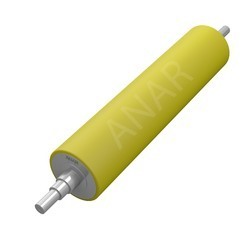 After measuring accurate dimensions and design Anar Rollers are uniformly coated with excellent flawless finish. Our Rollers are resistance to heat, corrosion, high temperatures, & are highly durable. 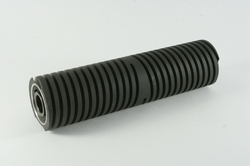 Offering our an excellent assortment of Damping Rubber Roller. Developed and designed in tandem with the industry set quality norms and guidelines, these products are widely utilized due to longer service life. Furthermore, to execute all the tasks of production in a trouble free manner, these are executed under the expert of our professionals team to maintain their quality norms. Our Deflector rollers/ Steering rollers are Excellent spring-back, high wear-resisting performance, make the strip high speed turning under tension, which makes the design of the production line is more compact, greatly enhance the efficiency of production line, and at the same time can also prevent slippage, strip surface scratch etc. We are manufacturer & exporter excellent quality of Sucker Muller Sizing Machine rollers and our product is used in textile industry. Impression roller is covered with rubber or another elastic polymer. Our skilled engineers ensure building impression roller for a quality print, press run ability, and roller life. The pressure of the impression roller against the gravure cylinder can be adjusted. We make sure that our Impression roller designed for dry applications in gravure printing as per client’s demand. We are the manufacturer & supplier of the best quality of Intermediate Roller which are produces by best quality raw materails by our latest machinery and our product is used in textile industry machines etc. Above price may vary as per customer requirement related to sizes etc. We offer our best quality Rubber Nip Roller to our clients.Our offered rollers are manufactured in such a way that we are able to maintain globally accepted standard . operation and targets to meet the international standard. We are recognized for manufacturing the best quality BOPP Film Plant Rubber Rollers that guarantees the very smooth in addition to effortless rolling of BOPP films. Our production methodology is very ahead in terms of technology and the products are made under the complete supervision of experts who check their quality at various stages of the production and ensure that they comply with the world-wide norms of quality. These are available in standard as well as custom-designed patterns. We are engaged in offering Nip Roller to our customers at most reasonable price. The entire range of nip roller is manufactured using high grade raw material, which is procured from our most trusted vendors in the industry. It comes in various sizes and can be customised as per customer as per industrial requirement. Anar MDO Nip rolls are used to press two or more sheets together to form a laminated product. The high pressure created at the nip point brings the sheets into intimate contact, and can squeeze out any bubbles or blisters that might cause a defective bond.